Can you believe it is time to start thinking about the end of the school year? I feel like I've been on a wild ride for the past three months! Busy, busy, busy, busy! I have a few resources in my Teachers Pay Teachers store for the end of the year. 1. Classroom management can become tricky at this time of year. The kids (and teachers) get spring fever. 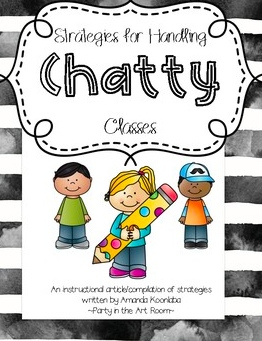 Check out this Strategies for Handling Chatty Classes resource. This resource provides strategies for handling chatty classes. It is not specific to the art classroom. Any teacher can use it! Included are graphics that can be printed to assist in using the strategies for classroom management purposes. For example, there is a handy list of call and responses that can be printed and put on a clipboard. These would be great for sub tubs as well. The resource focuses on Setting the Tone of the Classroom, Using Call and Response, Brain Breaks, Cooperative Structures, and Relationships. There are many quick-to-implement strategies presented here. Each strategy is explained in detail with tons of positivity! Only $8 for the 19 page resource! 2. Check out this End of the Year Artist Reflection sheet. Students can use this to reflect on their year in the art classroom. This is a good way for the teacher to determine how students perceive their time in the art classroom. Only $1! 3. 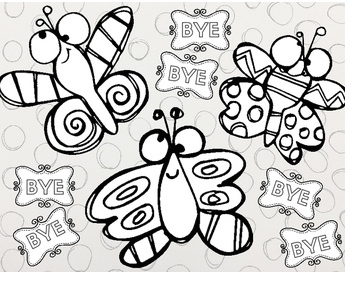 This Bye Bye Butterfly Glyph is an end of year glyph activity. I use this with my older kids on the last day of art class. I print one set of instructions for every table to save paper. You could also read the instructions aloud to younger students (or any students for that matter) as a listening activity.